You put all these together and you have a superb meal in no time. We absolutely love this dish. Beef, potatoes and beans.. everything seems right with this dish and it was. I always find comfort in meat and potatoes. Well, I grew up in a traditional Asian family. Rice with lots of other dishes and soup to either start or end the meal. Beef was never on the menu. Beans and potatoes were often cooked in the form of soups. I believe it is the western influence that started me on eating beef (nothing’s wrong with that, just saying!) and baked potato (jacket potato is what they called in the U.K). I love them and find comfort in this type of meal ever since. 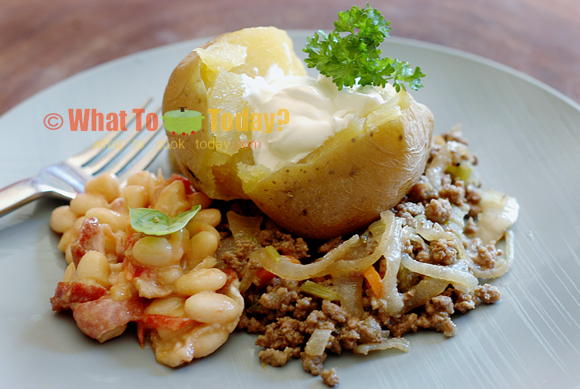 Baked potatoes with sour cream are so common in the western cuisine. Some people add chives to it. This recipe added fresh rosemary and believe me, a simple addition of that brings the potato to a different level. 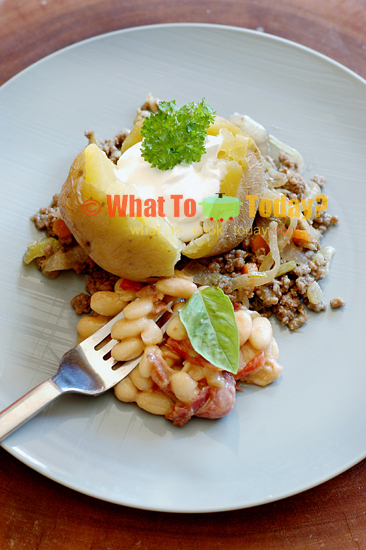 Beef hash is also another common one, but you spice it up with thyme, rosemary, Worcestershire sauce (almost got my tongue tangled up), eat it with the beans and potatoes, you will be so surprised by how good the whole deal is. I’m a kind of person who like to mix different dishes and it them together in one plate (I think my brother said “like a pig” but I’ve forgiven him and forgotten about it) and this is just perfect. Try it and you’ll have a great meal in no time!!!! Recipe is adopted from Jamie’s 30 Minute Meals cookbook published by Penguin Group.